After a rather tumultuous relationship with Hollywood in the past (Miller wrote the original screenplays that were heavily, um, altered for Robocop 2 and 3), legendary comic book guru Frank Millers star has been on the rise, cinematically speaking, in recent years. First there was Robert Rodriguezs near-note perfect translation to the big screen of Millers Sin City, which was so faithful to the series (and to its strengths and weaknesses), and relied so heavily on Millers input/approval, that Miller garnered himself a co-director credit. And, to tide Miller fanatics over until Sin City 2, theres now 300, Zack Snyders (the Dawn of the Dead remake) adaptation of Millers beautiful, ruthless graphic novel. Where 300 the book and 300 the film differ isnt so much in visual aesthetic (like Rodriguez, Snyder has attempted to translate Millers style, here more colour-oriented than the black and white dystopia of Sin City, to the big screen) but in what has been added and subtracted. Namely, the unrelenting harshness of Millers Spartans has been softened for the big screen, cracking jokes like they were all Gimli towards the end of The Lord of the Rings saga, while a Rome-like political machinations sub(par)-plot with Queen Gorgo has been added, which frankly rings false. Granted, Millers book is sparse concerning both plot and character development (besides the king, played well here by Gerard Butler), and there was a need to flush the tale out for the big screen, but it contradicts the "Spartans dont back down or compromise mentality greatly. However, apparently all the changes were Miller-approved. As well, while the hyper-stylised, comic book/dream world look works, at times (and allows for, um, visual exaggerations), it also hinders, especially in a world where viewers are used to seeing large-scale ancient battles that attempt some sort of accuracy and realism: The Lord of the Rings, Rome, Braveheart, Gladiator, Alexander, Kingdom of Heaven, etc. Sure, the slow-mo kills look awesome, as do the flapping capes and glinting helmets, and some of the creatures/enemies are CGImpressive, but the battles become repetitive and muddled, and it seems the movie should have been called 30, not 300, as thats about as many Spartans as you ever see on screen at one time. 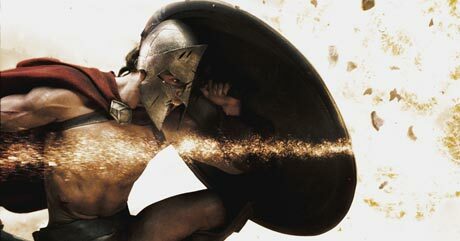 A lot is being made on-line about whether or not 300 is a political allegory regarding the current President of the U.S.  if Bush is Xerxes (invading Iraq) or Leonidas (fighting a desperate last stand against the U.S.s enemies)  and a case could be made for either depending on allegiances and conspiracy theories. But since the book was written years ago, and Snyder is hardly one to comment on political climates or culture (remember, he stripped his Dawn remake of the originals consumer critique), that seems highly doubtful.